Your home and location are amazing! We are truly enjoying it. The food was a wonderful treat to arrive too… We had a great day sitting around the pool and waiting for the feast tonight… Another magical night with Maria, the dinner was fabulous. We had a blast. Thanks Chrissie We arrived in time for a refreshing swim before a fairly dramatic rain storm. Everything is great. We have had a good look through the villa handbook and are getting to grips with what is in the vicinity. Everything is lovely, the lasagne and cake left for us on the first evening were much appreciated. We wondered if we could order another for Thursday. The weather is great!! Thank you so much for making our stay the more enjoyable by leaving us delicious food and wine, we loved the breath-taking views, the glorious sunsets, the moon that worked its way up to full by our last evening, the delicious Garfagnana specialities - and much, much more besides, the bottles of your delicious wine, which we all enjoyed drinking in the evenings on the balcony, and the million and one little details that make the Collina such an elegant, comfortable and very special place to be. Thank you once again very, very much. We had a very happy and thoroughly spoiling week at la Collina. We enjoyed the house and the pool. From us all, a very big thank you for a very happy week spent in a very beautiful spot! Your follow up before and after our last stay, was – in addition to the house/location - one of the key reasons we wanted to return. The two oldest are already looking forward to another visit! and we look forward to being able to explore more of the region. Everything was great as always!! Perfect place! All done like clockwork as usual! …. Just touched down back in Chicago yesterday and want to thank you again for all your help on our vacation planning in your beautiful home in Italy. What an exceptional place to spend a week, we were so fortunate to have found it – Thank you! We would all like to return some day for more adventures, good food, and to just enjoy La Collina del Sole ! We very much enjoyed our adventures to Lucca, Barga and Isola Santa, many thanks for taking such good care of us, the Pizza making dinner was fantastic with translation, and our feast was to die for. What Spoilage !! We had a fabulous time in your villa, and would recommend it to anyone. In a word the week has been magic. Very nice lasagne! We walked down to the wine festival and enjoyed pork sandwiches and glasses of wine and then walked back. The place is fantastic and we are all having a relaxing time. The team have looked after us very well, it felt like a home from home! Had a great day after a wonderful dinner last night. Relaxing morning, then headed into the village to the market, then on back to the supermarket. Scheduled wine and olive oil tasting for Thursday. Wonderful dinner tonight at home with lots of local produce. The pizza experience was wonderful and we did enjoy cooking some of the recipes we found in the cookbooks here at the villa! Wine Country scheduled for Wednesday. We would like another bottle of the red local wine brought to the house. It is a bit sweeter than what we usually drink, but one of our lady guests thought it was perfect for her taste. The team were wonderful!!!! Wish we had allowed enough time for the cooking lesson also, but we had already planned menus for the other nights and just enjoyed being here. Thanks! We had an amazing visit! We can't thank you enough for truly one of the best vacations we have ever taken. 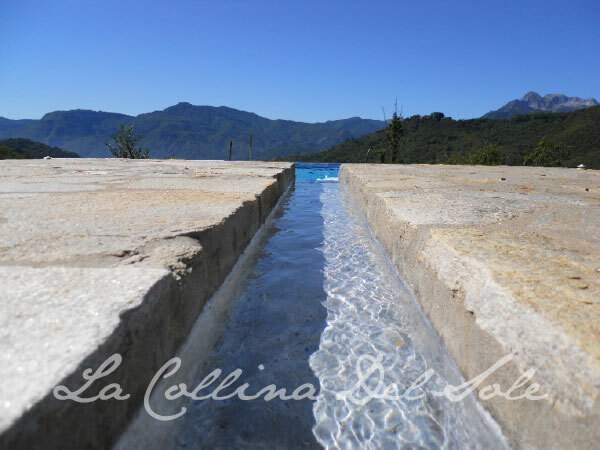 We love staying at La Collina del sole....truly paradise. Your team rolled out the red carpet for us and made us feel like we are family. We especially love taking full advantage of all the food services! Making authentic Italian pizza outside was a blast! We loved all the food that your team prepared for us... outstanding! We hope to come back to your spectacular villa again! Thanks for letting us take over your lovely Italian hideaway. It is, as you plainly know, a beautiful corner of the country and despite being there for 3 weeks, there are many, many places we have yet to get to - we have loved La Collina del Sole, and hope to return when we might get a bit more walking in. We will definitely recommend you to our friends, as will our guests - who all thought the house, pool and area were fab. I've become delightfully indolent here! At the weekend we went to the opera at Torre del Lago - quite magical. We have also cycled the walls of Lucca and explored the city - heard a delightful concert in the Cathedral, tried lots of your restaurant recommendations (all excellent) and strolled around some of the lovely old towns in the area. We shall be sad to leave - but will be taking lots of happy memories with us. Thanks too for your wonderful house book - so thoughtful and informative. We have explored the little shops you recommend in Castelnuovo G. and had a great meal last night. What with the yummy lasagne that was waiting for us when we arrived, I may need to explore the clothes shops too - looking for larger sizes! Thanks again for everything - you have really made this place something special! Your home is like a slice of heaven. Just spectacular. Everything went great! Thanks for another glorious trip! Thanks for making my Dad’s birthday extra special! We had a blast! I doubt there have been any better 70th birthday celebrations anywhere, anytime. La Collina del Sole was a perfect venue . . . just beautiful, and “la famiglia" were all just super. It’s so peaceful and visually stunning up there. The food was tremendous . . . the grandchildren are now qualified to open their own Italian Pizza and Pasta Parlor. I wanted to write and express my personal appreciation for all your efforts making this truly an occasion to remember forever. P.S. I’m ready to go back! We had another SPECTACULAR holiday at your lovely villa. The chocolate torta was delicious. I wish I could speak Italian, Mario brought us porcini and chanterelle mushrooms one morning. We had the chanterelles for breakfast and then cooked a nice thick steak for dinner and served the porcini as a side. They were AMAZING. In Lucca we rode bikes on the wall and did a visit to Barga for the afternoon. Back at work now but we are planning our next trip to Italy (again). Hugs from a very relaxed group at La Collina! that we didn't have to do the washing up! The holiday was much needed and came at a perfect time There is nothing like sunshine, beauty, good food and wine and the Lord! Having an amazing time and we're feeling v spoiled-The location is stunning. We ate on the terrace and spent many happy hours sitting and reading beside or swimming in the infinity pool - the views really couldn’t be much better. We barbecued, played games, snoozed, visited some of the lovely surrounding towns and villages, sampled a couple of the local restaurants and had a very relaxing time. Even a wet afternoon playing Bridge in the villa was lovely as you have made it so homely and comfortable. It was a wonderful rest for all of us. The villa is also so well equipped that we wanted for nothing. The info in the booklet was really helpful for trips out and meals out. We went to Claudio’s for his Friday fish menu (although it was seafood rather than fish) which was super. Had a great day after a wonderful dinner last night. Relaxing morning, then headed into the village market. Scheduled wine and olive oil tasting for Thursday. Wonderful dinner tonight at home with lots of local produce. The pizza experience was wonderful and we did enjoy cooking some of the recipes we found in the cookbooks here at the villa! Your home is beautiful and you thought of all the little details which make your villa spectacular. This place feels like home away from home, you have thought of everything to make this a perfect holiday. Thank you for the delicious lasagne which we enjoyed tonight for dinner and for the wine, we will be enjoying it tomorrow. Thank you for such a personal touch, we have rented many villas for holidays and yours surpasses all the others, we went to the pizza restaurant you suggested in your handbook and it was fabulous, the children really enjoyed. We would love to come back and we will definitely recommend your home to our friends. Wish I was there right now! All is well, your home is beautiful. Lasagne and apple cake were much appreciated. Looking forward to a very relaxing week ... We have been lucky enough to book tickets to see our favourite band THE KILLERS in the Piazza Napoleone at the Lucca Festival. Thanks for all your help... We have had an amazing week in what must be the villa with the best view we have ever had. The view is magical at all times of day. Your home is great and the pool is magnificent. Thanks Chrissie for all your help and all the information provided which helped us to make the most of our stay. Highly recommended are Maria’s meals, nothing better than eating a meal that you haven’t had to cook whilst admiring the view! Thanks again for everything you did to help us have a great holiday. We're just back from a beautiful hike in the area. Our stay at your villa was amazing, we enjoyed it and the beautiful area. The villa is well equipped and is ideal for a family vacation like we had. We couldn't hope for something better. On our arrival back home we'll write a warm recommendation for you villa, and suggest it to our friends. Spectacular, thank you for letting us share this little piece of heaven!!! ...the Place is beautiful. The stay has been fantastic and your restaurant recommendations have been outstanding, We hope to be able to return another time when my wife is no longer pregnant, to take some of the walks in the area and try some of the in-house menus. Focus on this trip has been rest and quiet which we definitely have achieved. Thank you for letting us stay at your idyllic villa. Heaven on earth …We woke up to this, we must be in heaven! Thank you, we are very happy. We are having our breakfast on our little balcony, while the others sleep! It is wonderful here, truly spectacular ...We saw the swallows today quite amazing to watch them drink ... Loved our time in your glorious home, the pool is top class! The view spectacular, as is breakfast on the patio, Heaven on earth. We enjoyed ourselves hugely in your beautiful house. Could you please say a big thank-you to the cooks and the translator who made pizza with our children? Our youngest was over the moon with his rabbit and finally (at the age of nearly two) managed to sleep through the night every day of the holiday. We're all agreed that we would love to visit again! We so loved the house and our whole Italian experience. The leisurely dinners where the five of us sat outside and talked for extended periods of time was completely worth the trip! You have found gems in the whole staff. Everyone was so nice and helpful! And that pool!!! It is to die for!! Absolutely loved it!! We were in it every day!! Thank you again for opening up your home to us and being so gracious!! … It was amazing! Beautiful house, pool view! Best vacation ever ! We really had a wonderful time – Thanks ! Back now thank you, and sad to not be waking up to the view of the mountains! Everything about the trip was brilliant and we all had such a great time - thank you so much. The house is amazing… was really organized and clean and we really appreciate that. I would definitely recommend your villa to others. … Great week lots of fun. Thanks for the update! The sun shade looks great! We had such a nice time in Italy and those memories will stay with us for a long long time. Having an incredible time (already planning our next Italy trip and definitely coming back to your most beautiful villa). This is paradise. The pizza experience was lovely and the three ladies are wonderful. Maria's herbs have been a real treat and I plan on making some savoury ricotta crepes tomorrow using local ricotta as well as the herbs from the garden. Words can't even begin to tell you how beautiful it is here. We are very content and have everything we need. I can’t even begin to tell you how much we loved your place. Because of your pool my son has finally gotten the courage to jump in the lake at our cottage (which he has never done) and without the use of a lifejacket (something he never felt comfortable doing before) but three to five swims a day at La Collina has cured all that. We are already discussing our next trip to Italy and rest assured we will be back to your MOST LOVELY place! It was a treat to stay at La Collina del Sole and the kids definitely were yearning after the pool for the rest of our time in Italy they thought your place was the best of the places we stayed..
Beautiful setting and lovely villa had a fantastic few days R&R, after 10 days of cycling and camping !! Thank you !! A lovely place where we had a wonderful time! I and the rest of the family/friends had a lovely time. The house itself is lovely and has everything one needs over there and the garden/vineyard was very well kept and pretty, I hope you don't mind us taking a few figs here and there... The pool is outstanding and summer life clearly centres around it, as did our time there. We enjoyed a few minor trips around the nearest towns (Castelnuovo di G and Braga) and had a very busy but good day in Florence. A couple of your restaurant recommendations were closed when we tried but we did get to have Claudio's fish menu on Friday which I can recommend and was good value for money. Also thanks for the welcoming lasagne and the few bits (milk etc) in the fridge when we arrived. What a beautiful villa you have in Italy, we so much enjoyed our stay and will definitely be back to enjoy the pool, views and tranquillity of La Collina del Sole. Thank you for the lovely lasagne and apple cake and for the well-stocked fridge and also, for the toys which … loved (the dog is called Bruno!). We found everyone to be truly lovely. You certainly have your place well cared for, and rightly so. I honestly can't think of any improvements that can be made to the villa, it is just perfect as it is. I can't tell you how much we have enjoyed your home here and the tranquility, beauty, and wonderful culture of the surrounding area. We will all have very fond memories of this place! Our pizza night was a lot of fun, and our pasta making class on Tuesday evening was quite memorable! They are coming back to tonight to make us a farewell dinner which we are all looking forward to. Thanks again for making possible such a wonderful and memorable Tuscan experience!!! We had a fabulous time! Can’t wait to come back. Everything was spectacular – villa, pool, views, culture THANK YOU !!! Just wanted to share our appreciation for sharing your little bit of paradise. A beautifully decorated and maintained villa. The pool offers fantastic views and every comfort is catered for. Thank you for sharing your little slice of Heaven with us! Now, if you could figure out how to bottle up the view and the fabulous natural scents and send them to Texas, we would be most appreciative! We very much enjoyed our stay and will be back with the entire family! The local hospitality was amazing! We can tell you have put a lot of love into the entire La Collina experience to make everything perfect! From deep in the heart of Texas, we send you a special heartfelt thank you! XO! Great Break – good company, good food, good walks, good wine, good everything in fact ! Great Pool! Lovely house, great location and a perfect holiday. It was a wonderful house in a truly magical setting, the views over the forested hill sides will stay with me for a long while. It was evident from many things about the house and the information you provided that you have spent a lot of time thinking about your guests and how to give them the best possible experience. We may well be in contact with you again next year for a return visit. I had the pleasure of staying at La Collina Del Sole in April 2010. The whole area is amazingly beautiful. The house is set amongst the hillside vineyards and orchards and has breathtaking views across the Serchio Valley. The house itself is magnificent and is very spacious and tastefully decorated. Although it has all the mod cons, you just know you are in a Tuscan farmhouse. Within easy rambling distance are a number of villages nestled in the hills which are great fun to explore, and everyone you meet along the way is so friendly and welcoming. Nearby Castelnuovo is a striking historic town with a delightful array of local shops including some wonderful bakeries, delicatessens and restaurants serving the most delicious food and local wines at very affordable prices. 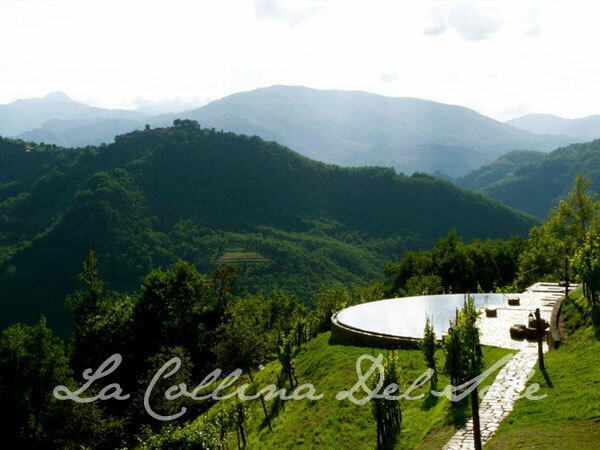 When you get tired of exploring and just want to relax, La Collina Del Sole is certainly the place to do it. The swimming pool has to be seen to be believed, and whether taking a cooling dip, lazing on a sunbed by the pool or enjoying an al fresco meal on the terrace, you just feel the cares of the world slipping away. While I was there, the Icelandic volcano erupted causing havoc with flights, but for me there was no better place in the world to be stranded. This beautiful villa shines in all seasons: be it sunbathing beside the mesmeric infinity pool, (which being salt water allows you to swim with your eyes open without a sting!) watching the beautiful swallows nose diving down to cool off their beaks, or happily snuggled up in front of the impressive open log fire with a hot chocolate. Perched on top of the mountain, it provides truly spectacular views which will have you transfixed at twilight as the red sun sets behind the distant peaks leaving behind the pinkest of skies. The house has every facility you could possibly need. The highlights are obviously the pool and the charming veranda. As for the local area and surroundings, they can't be beaten. If wild boar, or heaps of truffle pasta don't tickle your fancy, you can get the best pizza you'll ever have 15 minutes drive away in the quaint yet vibrant town of Garfaghana. This holiday home is truly amazing and secondo me (learnt some Italian too) the most peaceful, relaxing spot in the med. I had the great privilege to stay with a group of friends at “La Collina del Sole during the spring of 2010 and found it a most enjoyable and relaxing experience. I have been to Italy most years since 1976 and this was one holiday I will always remember, for the right reasons. The location is excellent for enjoying Northern Tuscany and its environs, whether for exploring the Tuscan country side or venturing into the adjacent towns not normally frequented by visitors. The location of the house enjoys a degree of remoteness but with the convenience of a 20 minute drive to the nearest town of Castelnuovo. I found the local people genuinely hospitable to foreigners. English was spoken in the larger towns. There were opportunities to use my Italian language skills, particularly in the villages. The wonderful thing about Italians is that they always try their best to understand, even if they have very, limited knowledge of English (or French). The house was newly renovated to exacting standards resulting in exquisite modern accommodation built very sensitively into the traditional environment. Views from the villa are breathtaking. Day trips to the better known areas such as Florence or Lucca are all easily achievable. Pisa Airport is a 90minute drive away. La Collina del Sole is a delight. If you want smart beaches, fashion shopping and a chic nightlife, this is not for you. But if you are looking for a lovely house and spectacular swimming pool with breath-taking views across the unspoilt countryside in the hills of north west Tuscany, then this is heaven. The village is an easy hour-and-a-bit drive from Pisa airport, past the mediaeval town of Lucca, and winding up the picturesque Serchio valley. Nearby Castelnuovo will supply all your basic shopping needs, and there is a lively weekly market on Thursday which is good fun. There are lots of local walks from the house to the cluster of nearby villages. And you are spoilt for choice for day trips to hill towns further afield, with excellent value-for money restaurants for lunch. If you enjoy Italian architecture, a day in Lucca is a must – and drop into Barga cathedral en route. The house has five bedrooms, with a large sitting room and dining room. Outside there is a rambling garden and a lovely sheltered terrace for meals and drinks. And the swimming pool is a wonder – you look right across the valley as you improve your breast-stroke. The house is at the end of the lane, so children on bikes are not exposed to more than the lightest traffic. All in all, the experience is a restful and refreshing change of pace from your daily duty. And the area seems to be largely undiscovered by tourists – long may this secret be kept! We have been lucky enough to have stayed at La Bora for the last five years – and we look forward to going back again this summer. We hope that you will enjoy this lovely spot as much as we do.